Pope Francis became the first pontiff to celebrate Mass in the Arabian Peninsula, the birthplace of Islam, on Tuesday, delivering an address to tens of thousands of people in Abu Dhabi at the end of a historic visit to the United Arab Emirates. The ceremony took place inside and around Zayed Sports City stadium, where a large crucifix — a rare sight in an Arab Gulf state — loomed above the makeshift steeple. “The Lord specializes in doing new things; he can even open paths in the desert,” he added. 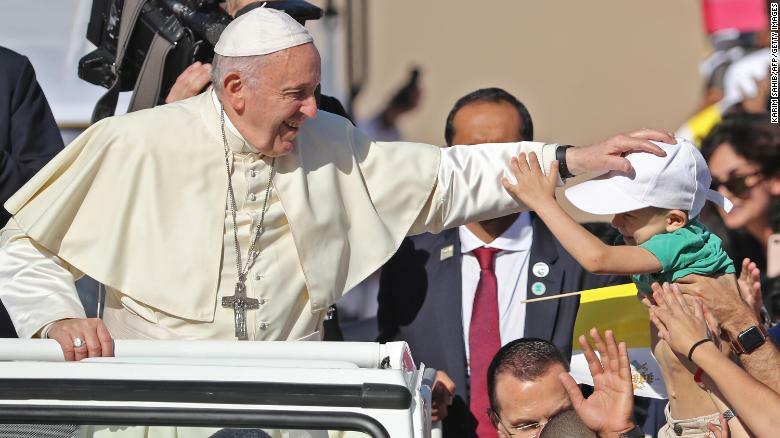 Pope Francis leads mass for over 100,000 Catholics at an Abu Dhabi sports stadium. The ceremony capped off a trip to the UAE that saw the Pope condemn the war in Yemen, in which his hosts have played a pivotal role, and call for religious freedom across the region. Images from the Pope’s tour of the pontiff flanked by Arab sheikhs in traditional robes were considered a striking display of Muslim-Christian kinship. 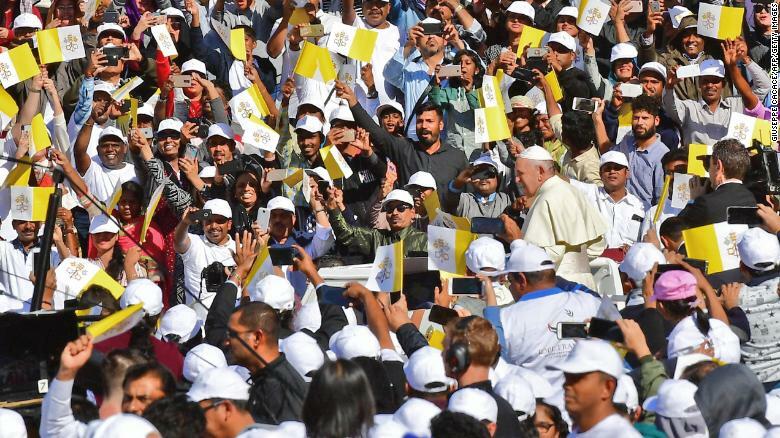 But rights groups dismissed the Pope’s description of the UAE as “a land that seeks to be a model of coexistence,” pointing to the country’s crackdown on dissidents in recent years. Prayers at Tuesday’s Mass were conducted in six languages — including French, Tagalog, Urdu and Konkani — for attendees from multiple Christian denominations, as well as some Muslims. Around 45,000 people crammed into the stadium while the rest of the attendees sat outside, with crowds sprawling outside the venue. The silence that hung over the crowd was punctuated only by prayers. “It’s overwhelming and very spiritual and it feels great to be together with everyone praying,” Palestinian Renad Jabaji who works in a technology company, told CNN. Nationals of the UAE are overwhelmingly Muslim, but some 90% of the population are expatriates, including around 1.2 million Christians. Pope Francis greets crowds as he arrives Tuesday. Francis blesses a child as he arrives at Tuesday’s Mass. Pope Francis kicked off his visit to the United Arab Emirates on Monday, arriving at Abu Dhabi’s lavish presidential palace in his trademark understated Kia Soul hatchback. The small black car — a notable choice in a kingdom known for its gold-plated lifestyle — was flanked by cavalry as it wound its way toward the palace. 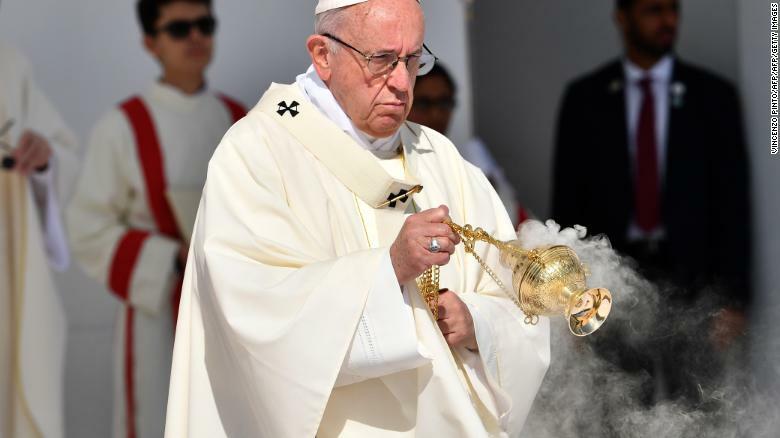 He was greeted with an artillery salute and aircraft trailing yellow and white smoke through the sky in honor of the Vatican flag. The Pope’s meeting with palace officials comes at a delicate political time for the UAE, which is involved in a coalition with Saudi Arabia in a war in Yemen. On Monday, during an inter-faith meeting, the Pope called on the world’s religious leaders to reject war, mentioning the conflicts in Yemen, Syria, Iraq and Libya. “Let us commit ourselves against the logic of armed power,” Francis said. He also warned against the “raising of walls,” in what could be seen as a reference to US President Donald Trump’s pledged border wall with Mexico. In a wide-ranging speech, the Pope also mentioned the sexual abuse scandal which has embroiled the Catholic Church for decades, praising a November meeting held in Abu Dhabi on child dignity in the digital world. In a handwritten message in the palace’s Book of Honor, the Pope thanked his hosts for their “warm welcome” and invoked “divine blessings of peace” on the people of the UAE. The Crown Prince, in turn, gifted the Pope the act of notary dating back to June 22, 1963, for a donation of land to build the first church in the UAE. While it is unknown whether Francis discussed the Yemen war with the Crown Prince during their private meeting, the Pope did issue a public plea for peace in Yemen from the Vatican on Sunday, just an hour before his departure for Abu Dhabi. In response, the UAE Minister of State for Foreign Affairs, Anwar Gargash, said in a tweet that he “welcomed” the pontiff’s prayers, calling on 2019 to be “the year of peace” in Yemen. The Tibet News promises to be a fair and objective portal, where readers can find the best information and recent news. We provide you with the latest breaking news and Tibet news. © 2018 The Tibet Times. All Rights Reserved.